I saw this idea over on Design Sponge when Wren Handmade was guest posting and knew it would be easy and fun. 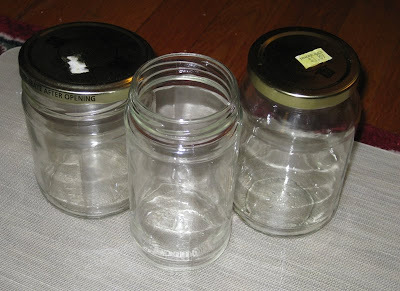 While watching TV last night I made 5 stylish storage jars with nothing more than some glass jars from the recycling bin and decorative paper. You could also use wrapping paper, brown paper bags, maps from vacation, color copies of photos, fabric scraps...basically anything you want. 1. cut paper circle a little bigger than the lid 2. 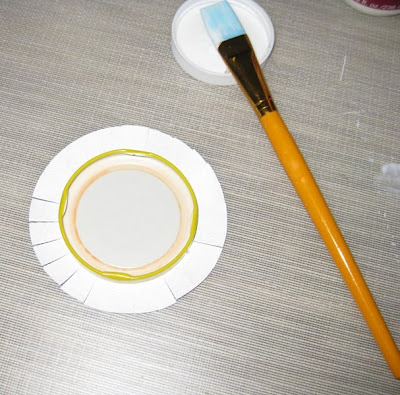 Use mod podge to affix the lid in the center of the paper circle 3. cut slits all around the paper edge 4. using more mod podge on the lid and the paper, wrap the paper around the edge of the top into the lid one strip at a time till all strips are wrapped around lid edge 5. to finish brush mod podge on the top and sides of the lid to seal in place 6. wait till dry and repeat, 1-2 coats should be good. Now holds extra tape, file folder tags and folder labels. When I get more jars I'll make him a few more. 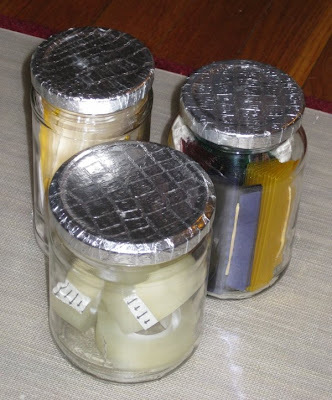 Now go save your glass jars from recycling and turn them into new stylish storage for those odds & ends you have hangin' around. Awesome idea - these are right up my alley. That is too cute. the dang trash man just came..maybe next week! These are adorable! I must try it. Right up my alley! 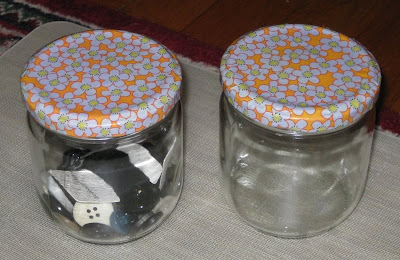 I save a lot of jars for these exact types of projects. They look great! That's such a cute idea! I have an old spaghetti sauce jar holding my clothespins. But even after thoroughly washing the lid and jar (in the dishwasher too), it still smells like sauce. 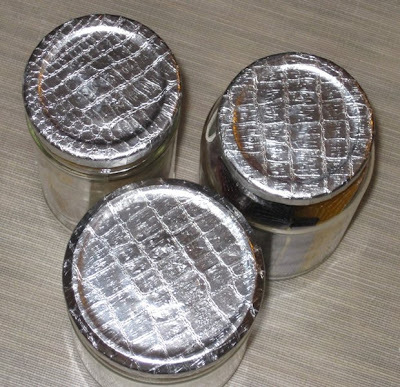 Any suggestions for eliminating odors or food residue before making the lid toppers? so cute! I love it! I am so going to do this! So many bits and bobs kicking around our house! um, I cannot thank you enough for this... i have several empty duke's mayonnaise jars i use for my son's snack foods i have been DYING to do something creative with...i searched online briefly and obviously just didn't use the right words! lol... anyway, thank you so much for this, love it! great idea!!! i love it. what a great upcycle! i love the silver faux animal print you used on them; they will look great in an office! Cute Cute Cute. I need to go through my recycling bin! I dream of doing...you actually do. And that is why I love your blog. Great post! I have been wanting to try this... yours looks great. i love them!!!!! so great!!!! will definitely have to try some this winter!!!! i love the flower paper you chose!